Baby G’s wardrobe is filling up with great homemade knits made by his two grandmas. I’m not a knitter myself, so my contribution will be homesewn. My very first piece is this corduroy overall. It was also my first project made on my new overlock sewing machine, and it was so much fun! 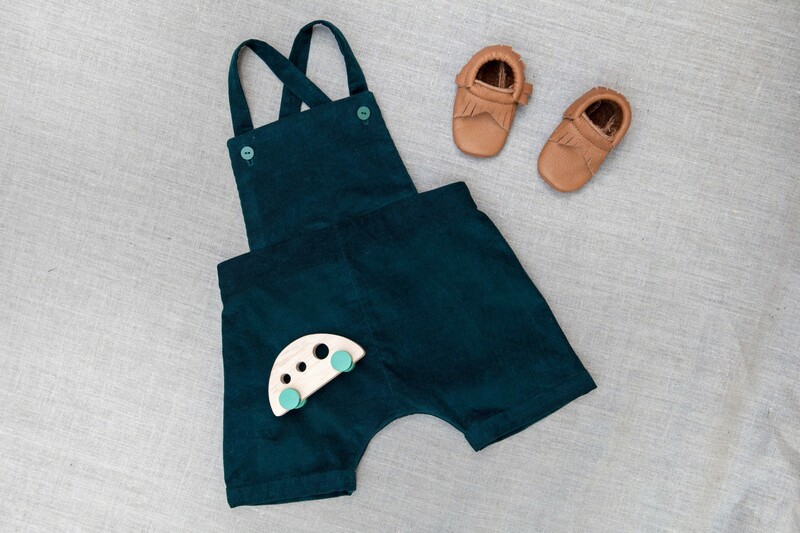 I havn’t actually tried the overall on a baby yet, so I’m not sure if the size is right. Please keep that in mind if you’re making the overall, and let me know if the pattern needs any adjustments. Download the pattern here, and keep reading for the tutorial. — 140 cm x 50 cm non-stretch fabric. 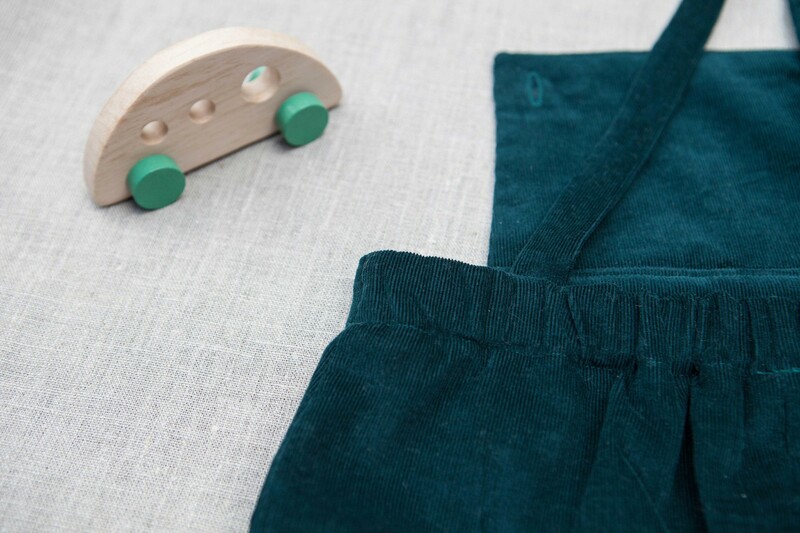 I’ve used a deep blue green corduroy from Stoff & Stil. 1 – Prepare your fabric according to the fabric care instructions (meaning wash, iron and stretch the material) before you cut it. 2 – Cut the fabric according to the layout plan (download free pattern here). Make the markings on the wrong side of the fabric. 3 – Serge the raw edges on the side seams and center seams of the bottom front (1) and back (2) pieces. 4 — Pin the bottom front (1) piece together at center front with the right sides of the fabric facing. Stitch and press seam allowance apart. Do the same for the back (2) piece. 5 — Pin bottom front piece (1) and back piece (2) together at side seams with the right sides of the fabric facing. Stitch and press seam allowance apart. 6 —Pin bottom front piece (1) and back piece (2) together at crotch with the right sides of the fabric facing. Make sure the center seams on the front and back piece match. Stitch the crotch with a 1,5 cm seam allowance, and the repeat with a 1 cm allowance on the outside of the first seam. Cut away the allowance just outside the second row of stitches to prevent bulkiness. Serge the raw edge. 7 — Pin top front (3) piece together at top edge with the right sides of the fabric facing. Stitch leaving a 1,5 cm seam allowance free at side edges. Press seam allowance apart, then towards facing. Understitch top edge. 8 — With right sides facing, pin side seams of the top front piece (3) together and stitch. Press seam allowance apart then towards facing. Understitch as far as possible. 9 — Turn the top front pieces with right ides out making sure you get nice and straight corners. Match the bottom edge and bast with loose stitches. 10 — Pin top front (3) piece to bottom front (1) piece together with matching markings and right sides facing. Baste with loose stitches. 11 – Fold each hem band (4) lengthwise with right sides facing in. Press. Baste with lose stitches 1,5 cm allowance of one of the long sides of each hem band (4). Press towards center with wrong sides facing. 12 — Pin short edge of each hem band (4) together with right sides facing to form a ring. Stitch and press seam allowance apart. 13 — Pin unfolded edge of hem band (4) to bottom edge of the leg matching side seam of hem band (4) to crotch seam. Stitch and press allowance towards hem band. Blindstitch folded edge of hem band to the leg on the inside of the garment. 14 — Fold each of the straps (5) lengthwise with right sides facing in. 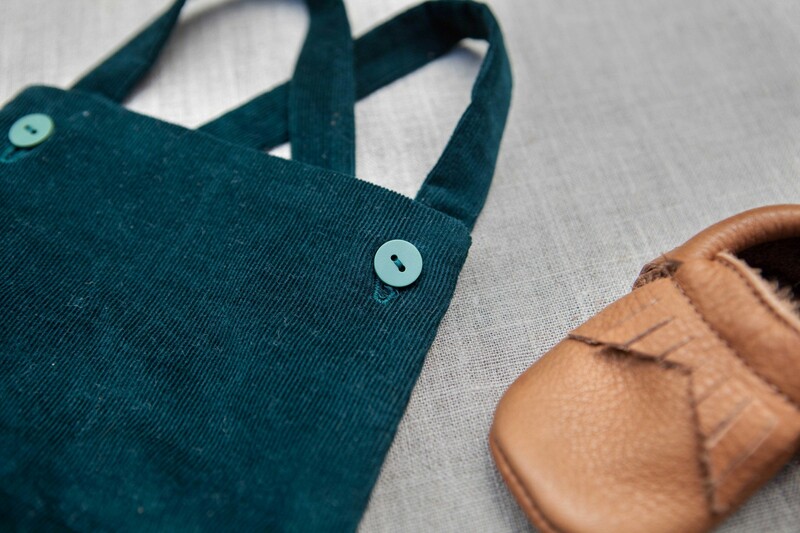 Pin the short edge with the markings for the buttons, and stitch. Press seam allowance apart. 15 — Pin the sides together and stitch. Turn the straps (5) open with right sides out and press. Topstitch if you prefer. 16 – Pin the end of the straps (5) with the open edge to the back piece (2) with matching markings. Baste in place. 17 — Pin short edge of facing (6) together with right sides facing. Stitch and press seam allowance apart. Option #1: Pin the bias tape to the unmarked edge of the facing with right sides facing. Turn bias tape around seam allowance around raw edge and stitch in place. Option #2: Serge raw edge of unmarked side of facing (not using bias tape). 18 — Pin facing to top edge of the front and back piece with right sides facing. The top front piece (3) and the straps (5) are placed between the shorts and the facing. Stitch, press seam allowance apart then towards the facing. Understich the facing. 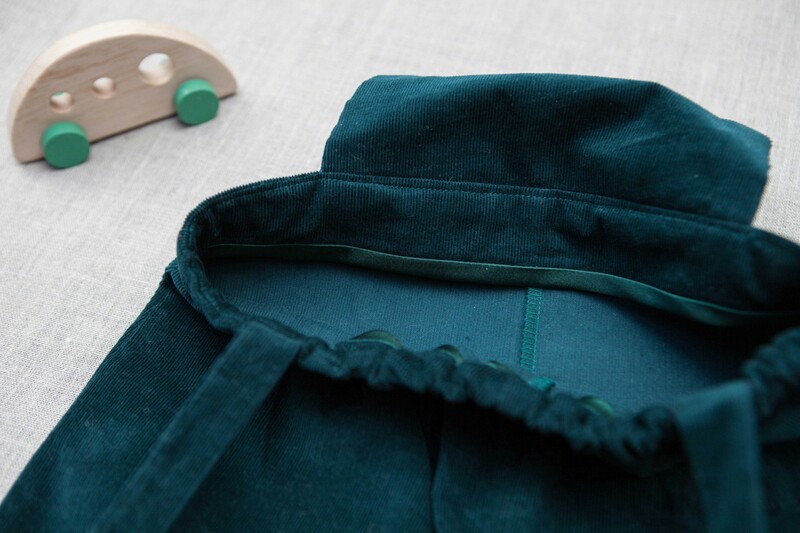 19 – Make buttonholes where marked on the top front (3) piece using the instructions for buttons on your sewing machine. Make sure the hole matches the size of your buttons. 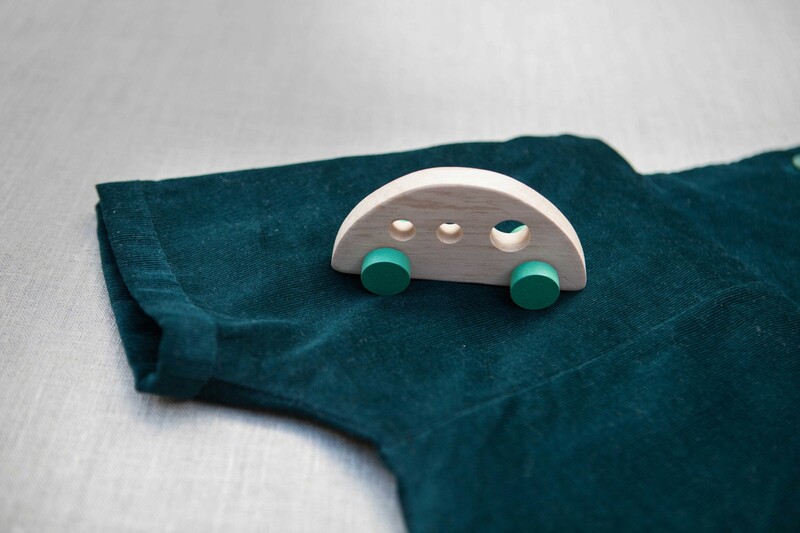 20 – Sew the buttons where marked on the straps, or where they need to be placed to best fit the little one who is going to wear the overall. Then you’re all done! Feel free to ask if you have any questions, and please let me know if there’s any issues with the pattern or tutorial. Hi Kristine. No, you're not doing anything wrong. I made the shirt available for A4 printing, while the pattern for the overall was just for larger paper sizes. But I've just updated the pattern for the overall so that is also available for A4 printing, so feel free to download it again :-). Best of luck with the rest of your pregnancy <3!